Buy from us and you can buy with confidence. We can be contacted by phone or by email, and if you want to pick-up, you can come into our store! If you're looking to restore a car, this rotisserie with gear box rotation is a great asset for any mechanic shop or DIY project. It makes easier for mechanic and body shops to do framework and other tasks. This rotisserie allows you to move the car around easily in order to make your workshop more functional whilst working on the project. Features a 3000lbs/ 1360kg working capacity and a full 360 spin movement for easy access to any part of the car without hassle. Comes with a turning handle, bearings, movable stand, these will give you the most flexible spinning system for any car body. 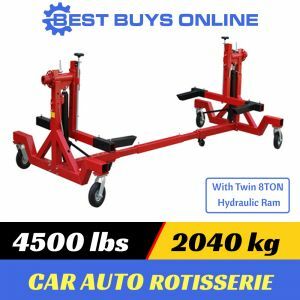 There are two 8 ton hydraulic jacks to elevate the car to the required working height and solid phenolic castor wheels for easy maneauverability. Constructed with heavy-duty powder coated steel, this heavy duty rotisserie is highly resistant to abrasions, oils and greases. 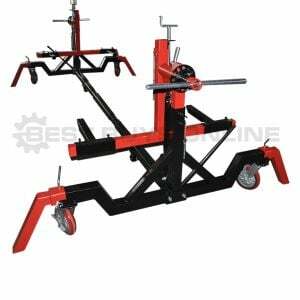 This convenient and great asset is easy to break down for storage and allows you to restore frame and body of any car with eas thanks to its adjustable width, height and centering capabilities. Suitable for cars and small truck bodies and frames.